Some powder hounds may think that nothing can beat the rush of endorphins and adrenaline that comes along with a speedy ride down a steep slope. 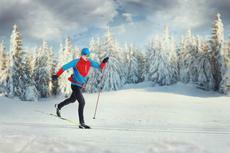 But other winter sport enthusiasts may disagree because for them a slower-paced approach is preferred. For that latter group, cross-country skiing is absolutely one of the most ideal ways to explore and enjoy the great outdoors during the winter season. Plus, one of the best things about the sport is that it isn’t only for people who don’t particularly enjoy downhill skiing. The sport caters to skiers of all levels and abilities and offers its own unique thrills and amusements. Bonus: It also makes for a killer workout. Be prepared for your quads to work. If this sounds like a winter sport that’s just your style then you’ve got no excuse not to give it a try. And if you’re wondering where to go for some great cross-country skiing terrain, start by taking a look at some of the top cross country skiing spots around the world.